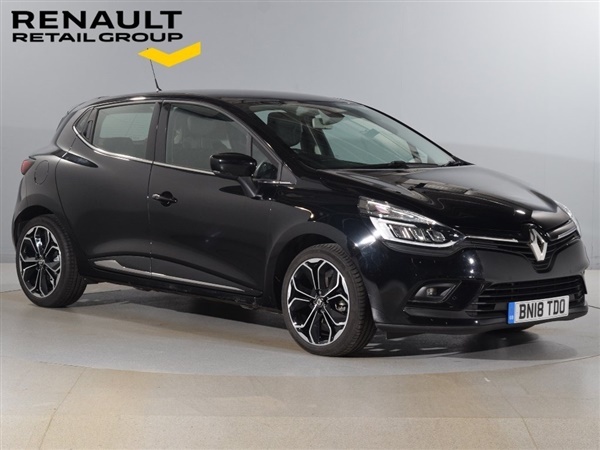 Black, 2 years free servicing with PCP Finance.2018 18 Renault Clio 0.9 TCe Dynamique S Nav, finished in Diamond Black . This vehicle has covered 10358 miles from new and was previously on loan to a Renault employee and has been fully maintained and serviced by Renault Retail Group.Next MOT due 25.03.2021.This vehicle is covered by the remainder of a Renault 3 year Manufacturers Warranty!Factory -Fitted Extras Include, Satellite Navigation,17in Alloy Wheels,Cruise Control,Central Locking,Keycard - Hands Free,Immobiliser,Traction control,Hill Start Assist,Bluetooth,DAB Radio,7in Touchscreen, Rear Parking Sensors, Full LED Headlamps., 1 owner, Navteq Navigation, 7in Touchscreen, Auto Climate Cont. w. One Touch Quick Demist Func., Cruise Control, Rear Parking Sensors, (HSA) Hill Start Assist, Alloy Wheels - 17in with Black Inserts, Automatic Front Wipers, Bluetooth Handsfree Technology, Front Electric Windows with One-Touch Facility and Anti-Pinch Function and Rear Electric Windows, MediaNav Multimedia System, FM/AM/DAB Tuner, Bluetooth Audio Streaming, AUX Socket, Thatcham Approved Alarm, Tyre Pressure Warning Light. 5 seats, Click Call Collect Today!